Double action. Total hydraulic control with maximum opening angle 130° in each direction. Adjustment valves of winging speed and latching speed are fully independent, which will save time of adjustment.Securely designed speed adjustment valves protect Floor Spring from rough use or adverse weather conditions.The speed adjustment valves can not be backed out of Floor Spring when adjustment that eliminates oil leakage from the valves.Reduced thickness of 40 mm only safely for thinner slab. 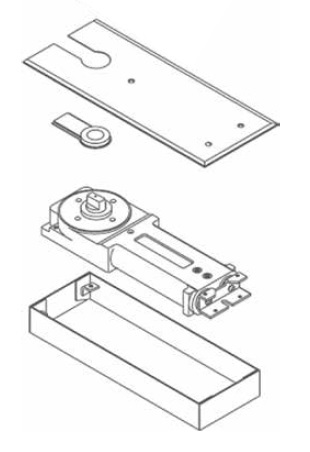 Maximum door width 1100 mm, maxim door weight 100 kgs.